Atimm693 wrote: If you are routinely raking a lot of heavy windrows with it, it may plug now and then, but again, I think that's a problem with all V rakes. I was curious if that was typical. I don’t own a v rake, but I was considering getting one. I used a neighbor’s rake this year in thick hay, and it was the most aggivating thing ever with it piling up. It was an older one, but I was wondering if this was more typical of certain brands. Raked these a couple weeks ago. This about the limit of what the Vermeer will handle without plugging up. It's Johnson grass and fescue BTW. What kind of tractor is that? Gauge cluster reminds me of my father in law's McCormick. I've got an older Vermeer with the framework behind the wheels, uses two hydraulic circuits - one for adjusting width and one for raising the wheels. I've never plugged that thing, even in 10' tall sudangrass. For curiosity's sake, where do you call home? ddd75 wrote: i've found a lot of people turn a V rake just like the old bar rakes.. making a 180 degree turn as soon as your done with the row and going back. That turn pulls all that hay, gets caught, and balls it up. I just run a full spiral all the way around the field.. easier on the rake, the baler, etc. never balls up. I'm not sure I follow. I rake my outside rounds (6 swaths) and bale them. Then when I rake I lift up at the end of the row, skip two swaths, and start back the other way. Valtra was only sold in the US for a few years, and in 2002 Agco acquired the company (I've been told mainly for their engine manufacturing) and killed them off. It's a shame, they are fantastic tractors. I think he means that they don't pick the rake up and just let it drag when they turn around. They really don't work well at all in a sharp corner, as the inside wheels are rolling backwards. 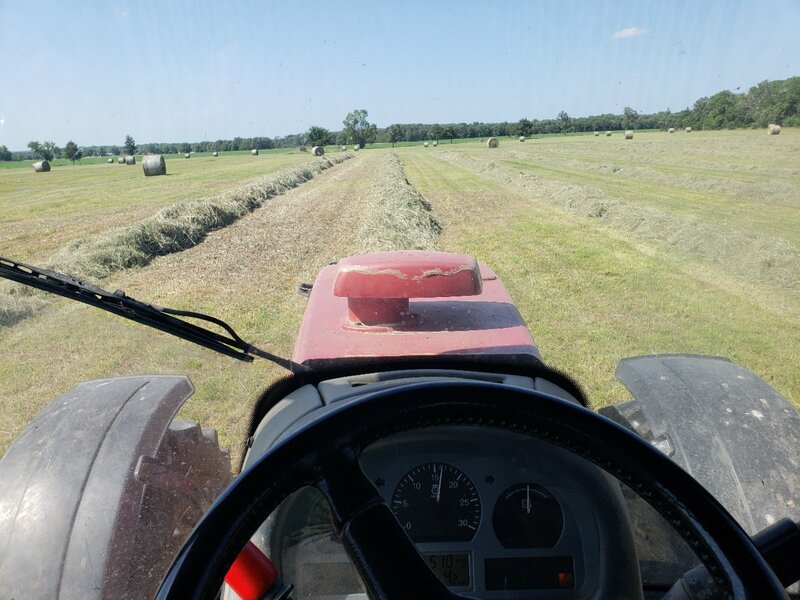 Many times I rake a field before the baler gets there, we mow 6 passes around the outside, and then start mowing back and forth on the inside. I'll rake the 4 outside passes, do the inside of the field, and then rake the last two inside edge passes. This cleans up the left over "V"s from not having room to pick up the rake all the way when I turn around. I bought the Vermeer VR 1022...I have a very good dealer here, bought a 504R signature baler last year it is great. brw wrote: I bought the Vermeer VR 1022...I have a very good dealer here, bought a 504R signature baler last year it is great. Have you baled any high moisture hay with the 504R? Any complaints about the baler so far? Interested in response also. A neighbor bought one last year and I looked at some of the hay baled, it looked good, but have not ask him how he likes it yet. I have looked at these as well. I really like them but don't know anyone who has one. Thanks. Have you ever plugged it? Stopped at the local dealer yesterday and took a look at the new Vermeer balers. As cfpinz said a remake with singularities to a JD baler. I may send an email to Vermeer and ask why the change? jltrent wrote: Stopped at the local dealer yesterday and took a look at the new Vermeer balers. As cfpinz said a remake with singularities to a JD baler. I may send an email to Vermeer and ask why the change? I'll be curious how they respond. Betting it'll have to do with simplification. I love my M, but that pickup head has a ton of moving parts - and in turn, wear items.